Rosa damascena is known as “Gol-e-Mohammadi” in Persian. Iranian traditional medicine recommended decoction of the flowers for treatment of chest and abdominal pains, menstrual bleeding, and constipation., Rosewater is also known as analgesic, anti-inflammatory, hypnotic, and antitussive agent. Flowers serve to produce different commercial products including rose essential oil, rose water (hydrosol), dried rose hips, concrete and rose absolute. Rose hydrosol is made by hydrodistillation of flowers. Hydrosol is traditionally famous as “Golab” with typical flavor and scent that mostly related to the religious ceremonies. Microbial contamination is one of the serious problems of the product that may occur during storage in nonsterile containers, keeping in inappropriate temperature and sometimes use of nonsterile water for dilution before packing. Inadequate storage conditions lead to metabolize aromatic and other compounds by microorganisms. Spoiled hydrosol not only reduces its chemical quality but also reduces major amount of rose water. Ultrafiltration is a selective separation process to remove high molecular weight molecules. Ultraviolet (UV) light is a germicidal agent that affects on surfaces or liquids such as water with variety of applications in the food industry. The purpose of this study was elimination of microbial contamination of rose water by ultrafiltration and UV treatment. The effects of these agents on essential oil composition of rose water were also determined by gas chromatography–mass spectrometry (GC/MS). Different brands of hydrosol were collected from local market in Fars province, Iran. Eight samples were produced by water distillation method in traditional pot (T) and two samples were produced by modern (industrial) industries (I). Volatile constituents from hydrosol were subsequently extracted by liquid–liquid extraction using petroleum ether at ambient temperature, and the residuals were analyzed by GC/MS. The GC/MS was performed by a gas chromatograph equipped with mass detector. The analysis was carried out under the condition which was described in previous study. Determination of samples constituents was based on the comparison of its relative retention time and mass spectra with Wiley 275 and Adams data libraries as well as to those of the related literatures. Two liters of hydrosol were poured into feed tank then passed through the first filter using a peristaltic pump to remove large particles. Subsequently, the hydrosol was moved into the second filter (UF filter) to clarify spoilage microorganisms of rose water. Afterward, rose water was forced to pass through a UV source (254 nm) and 110 ml/min flow rate. This system was washed by deionized water completely after each sample. To define the microbial changes in hydrosol treated with preservative procedures, pour plate method was applied to count the number of colony-forming bacteria present in the liquid sample. Each sample was enumerated by this method before and after ultrafiltration and ultraviolet (F-U) treatment. According to the results presented in [Table 1], the most samples were rich in phenethyl alcohol, citronellol, and eugenol, respectively. Before treatment, phenethyl alcohol was more than 60% in eight samples and other important compounds were geraniol and methyl eugenol. There was no significant difference between constituents of traditional and industrial samples. 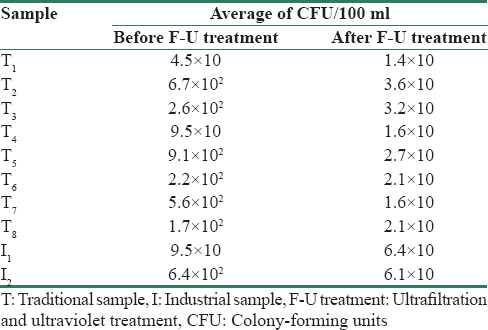 After treatment, although phenethyl alcohol, citronellol, and geraniol remain the main components of all samples, phenethyl alcohol was reduced in seven samples after pass the F-U treatment. There was no general trend in reduction or rise in identified components percentages in traditional and industrial samples before and after F-U treatment. It seems that F-U treatment unable to change rose water constituent, significantly. The results in [Table 2] showed that T4 and I2 are the most contaminant samples before F-U treatment. There was a high rate of diminution in the microbial number in eight samples after F-U treatment. Proper results of F-U treatment show the possible efficiency of UF filtration and UV treatment to reduce number of microorganisms. The main components of samples in this research were similar to the results of previous studies which were done in Iran and Turkey. In addition, the citronellol, geraniol, and phenethyl alcohol were reported as the main components of rose water in a previous study. The content of phenethyl alcohol in rose water extracts can be different according to type of solvent. In one study, the percentage of phenethyl alcohol was reported about 80% while using dichlorometan for extraction of volatile content of rose water. Although we used petroleum ether for extraction of phenethyl alcohol in a range of hydrosol which have studied, it seems that this content depends on chemotype and times of petal collection in spring. Phenethyl alcohol was known as the main constituent of rose hydrosol and possesses pleasure flavors and fragrances., So it reveals the important role of rose water in perfumery industries. 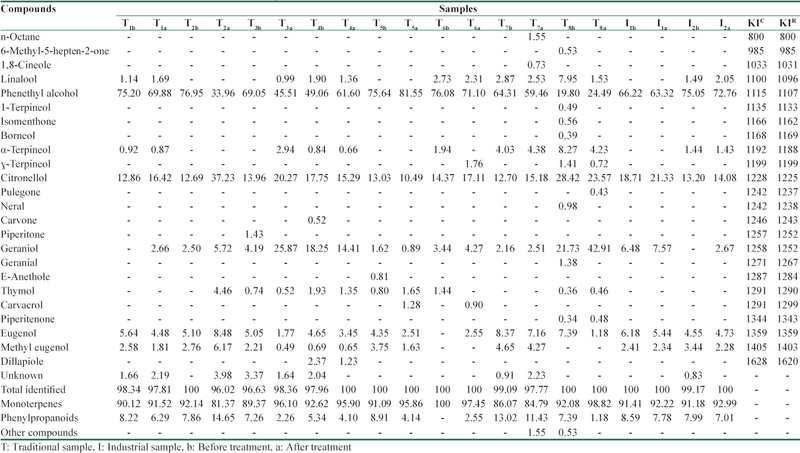 According to [Table 1], the percentage range of methyl eugenol were 2.28-3.44% and 0.49- 6.17% in industrial and in traditional samples respectively. R. damascena Mill. and Methyl eugenol was 0.11% in fresh rose concrete. and it was 1.7% in historical rose oil sample which samples were more than 50 years old. The deferred harvest and protracted distillation procedure is cause of increase eugenol in rose oils. Beside its broad applications in food and cosmetic industries, genotoxicity and carcinogenicity effects of this compound confirmed in different studies. Generally, it seems that the main chemical composition of rose water oil protect through F-U treatment. Membrane technology is standard approved technology in the beverage industry. Furthermore, ultrafiltration has wide applications in fruit and vegetable juices to remove fibrous pulp and spoilage microorganisms with several advantages comprise: preserve the nutrition value, safety, user and environmental friendly. UV light provides effective inactivation of different microorganisms by damaging DNA. This light is only effective on surfaces or clear liquids. Previous study showed that UV radiation reduces microbial load of fruit juice and nectar comprising bacteria, viruses, yeast, and molds. Fortunately, UV application in this study does not change phytochemical content of hydrosol significantly. In other study, counter to the thermal treatment, UV processing does not have any effect on pectin methylesterase activity as well as the color and pH of the orange juice. Also, the UV radiation is defined as alternative process to reduce contamination of wine-related microorganisms such as Brettanomyces, Saccharomyces, Acetobacter, Lactobacillus, Pediococcus, and Oenococcus in grape juice and wine. Our result indicates that F-U treatment not only reduces microbial load significantly but also has no noteworthy effect on chemical constituents. In the next step, it is necessary to realize the type of microbes was affected by these methods. Furthermore, adding accepted chemical preservative compounds after hydrosol production and during storage may be another possible way to preserve the quality of hydrosol as healthy beverage and food additive. This study was financially supported by Shiraz University of Medical Sciences, Shiraz, Iran (Grant number: 94-01-70-11179). The study was supported by a grant from the Research Deputy of Shiraz University of Medical Sciences. Boskabady MH, Shafei MN, Saberi Z, Amini S. Pharmacological effects of Rosa damascena. Iran J Basic Med Sci 2011;14:295-307. Mahboubi M. Rosa damascena as holy ancient herb with novel applications. J Tradit Complement Med 2016;6:10-6. Baniasad A, Khajavirad A, Hosseini M, Shafei MN, Aminzadah S, Ghavi M. Effect of hydro-alcoholic extract of Rosa damascena on cardiovascular responses in normotensive rat. Avicenna J Phytomed 2015;5:319-24. Moein M, Zarshenas MM, Delnavaz S. Chemical composition analysis of rose water samples from Iran. Pharm Biol 2014;52:1358-61. Moein M, Etemadfard H, Zarshenas MM. Investigation of different Damask rose (Rosa damascena Mill.) oil samples from traditional markets in Fars (Iran); focusing on the extraction method. Trends Pharm Sci 2016;2:51-8. Agarwal SG, Gupta A, Kapahi BK, Thappa BRK, Suri OP. Chemical composition of rose water volatiles. J Essent Oil Res 2005;17:265-7. Baydar H, Kuleasan H, Kara N, Secilmis-Canbay H, Kineci S. The effects of pasteurization, ultraviolet radiation and chemiclal preservatives on microbial spoilage and scent composition of rose water. J Essent Oil Bear Pl 2013;16:151-60. Mohammad AW, Ng CY, Lim YP, Ng GH. Ultrafiltration in food processing industry: Review on application, membrane fouling, and fouling control. Food Bioprocess Tech 2012;5:1143-56. Guerrero-Beltran·J, Barbosa-Canovas G. Advantages and limitations on processing foods by UV light. Rev Agaroquimica Tecnol Alimentos 2004;10:137-47. Mirza M, Nvavaei MN. The effect of distillation method on extracted compounds from Rose water. Iran J Med Aromat Plants 2007;3:375-81. Verma RS, Padalia RC, Chauhan A, Singh A, Yadav AK. Volatile constituents of essential oil and rose water of damask rose (Rosa damascena Mill.) cultivars from North Indian hills. Nat Prod Res 2011;25:1577-84. Yarazavi M, Shamspur T, Afzali D, Mostafavi A. Comparison between the concretes obtained from fresh and distilled Rosa damascena mill. flowers. J Essent Oil Bear Pl 2016;19:479-84. Almasirad A, Amanzadeh Y, Taheri A, Iranshahi M. Composition of a historical rose oil sample (Rosa damascena Mill., Rosaceae). J Essent Oil Res 2007;19:110-2. Baydar H, Schulz H, Krüger H, Erbas S, Kineci S. Influences of fermentation time, hydro-distillation time and fractions on essential oil composition of Damask rose (Rosa damascena Mill.). J Essenl Oil Bear Pl 2008;11:224-32. Rusanov K, Kovacheva N, Rusanova M, Atanassov I. Reducing methyl eugenol content in Rosa damascena Mill rose oil by changing the traditional rose flower harvesting practices. Eur Food Res Technol 2012;234:921-6. Pellati F, Orlandini G, van Leeuwen KA, Anesin G, Bertelli D, Paolini M, et al. Gas chromatography combined with mass spectrometry, flame ionization detection and elemental analyzer/isotope ratio mass spectrometry for characterizing and detecting the authenticity of commercial essential oils of Rosa damascena mill. Rapid Commun Mass Spectrom 2013;27:591-602. Yassa N, Masoomi F, Rankouhi SE, Hadjiakhoondi A. Chemical composition and antioxidant activity of the extract and essential oil of Rosa damascena from Iran, population of Guilan. DARU 2009;17:175-80. Cheryan M. Ultrafiltration and Microfiltration Handbook. Boca Raton: CRC Press; 1998. Keyser M, Műller IA, Cilliers FP, Nel W, Gouws PA. Ultraviolet radiation as a non-thermal treatment for the inactivation of microorganisms in fruit juice. Innov Food Sci Emerg Technol 2008;9:348-54. Tran MT, Farid M. Ultraviolet treatment of orange juice. Innov Food Sci Emerg Technol 2004;5:495-502. Fredericks IN, du Toit M, Krügel M. Efficacy of ultraviolet radiation as an alternative technology to inactivate microorganisms in grape juices and wines. Food Microbiol 2011;28:510-7.